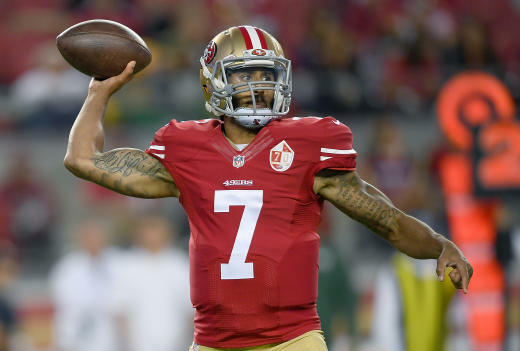 Colin Kaepernick is not a very good NFL quarterback any longer. He was benched last year by the San Francisco 49ers in favor or Blaine Gabbert. That says it all. This statement really isn’t up for debate. 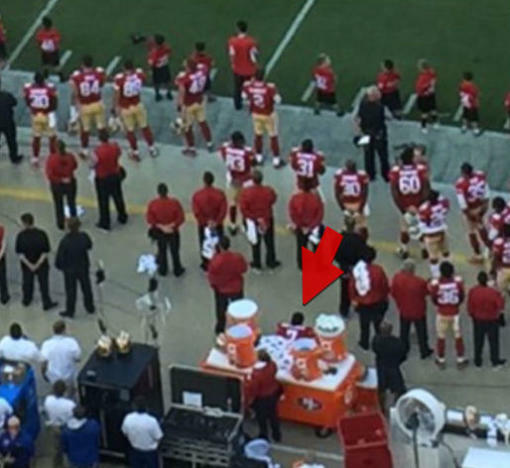 But the 28-year old has stirred a significant national debate after he refused on Friday night to stand during the pre-game playing of the Star-Spangled Banner. The controversial incident took place prior to a preseason game against the Green Bay Packers. What prompted Kaepernick to make this decision? He says it was a matter of conscience, of doing something that would call attention to the plight of African-Americans. “To me, this is bigger than football and it would be selfish on my part to look the other way. Kaepernick did not get into specifics, but he is most likely talking about the rash of African-American deaths at the hands of police officers over the past several months. It’s a topic many professional athletes are starting to raise, with Carmelo Anthony, Chris Paul, Dwyane Wade and LeBron James opening this year’s ESPY Awards by making a plea for racial harmony. For many, these deadly and dangerous issues culminated in June and July with the deaths of Alton Sterling and Philando Castile at the hands of police officers. Both black men lost their lives in confrontations with the police, seemingly in needless, irresponsible fashion. These deaths were followed by the killing of five cops in Dallas by a deranged sniper. The 49ers, meanwhile, issued a statement about Kaepernick’s stance. “The national anthem is and always will be a special part of the pre-game ceremony. It is an opportunity to honor our country and reflect on the great liberties we are afforded as its citizens. The move has created quite a bit of controversy. Many appreciate Kaepernick calling attention to a pressing national topic such as this. Aren’t we always asking athletes to use their platforms for something bigger than sports? Didn’t we just celebrate the life of Muhammed Ali? Possibly the most revered and respected athlete of all-time, Ali refused to be drafted into the United States Army during the Vietnam War. He basically spat on his country at the time for its racist tendencies and misguided international policies. 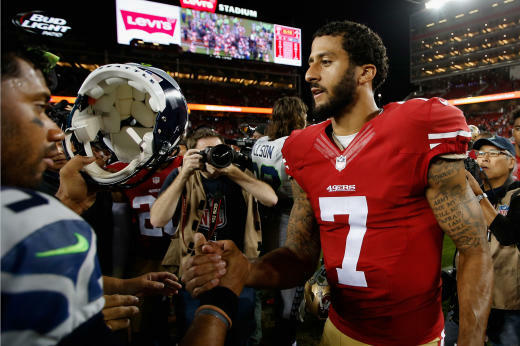 Critics of Kaepernick, however, are saying such asinine things as college basketball analyst Doug Gottlieb. First, the entire point here is that Kaepernick is thinking above and beyond himself. Shouldn’t he be applauded, not criticized, for putting societal problems ahead of his paycheck? What Gottlieb (and others who have written similar things such as this) are essentially saying is that a black man should stay quiet because a very rich white man is paying him a lot of money to do his job… which, in the end, is making that rich white man a lot more money. We have no doubt Kaepernick is grateful for his situation and well aware that America is the best country on Earth. We also hope he’s doing a lot more about the racial strife in this country that just sitting down during the national anthem. But are people really saying that it’s more patriotic to simply stand up during the playing of a song than to make a gesture that aims to help bring about equality? Because that belief is just ridiculous. Bella Thorne: I Am DONE With Scott Disick! Johnny Depp: I May Be Broke, But I Will NOT Sell My Jet! Next story Javi Marroquin to Kailyn Lowry: You Know What You Did! !